2018 was a good year; a busy one with a new schedule but enough time to create a few projects. I’m always excited to create blankets and wee hats for babies! I love the waffle stitch and used it for a few projects because it’s so simple yet it has such an impact. And I adore the classic chevron it just called to me when deciding how to use those oh so soft yarns. I only made a few but love the amigurumi that I tried this year. Both patterns are from the same designer. A friend loved my little sleeping bunny so much she asked that I make twin bunnies for her. I’ll share more about the Abominable Snowman later. I was pleased with how he turned out but I did have to substitute a different yarn. Kudos to Spin-a-Yarn for her incredible perseverance in using the pipsqueak yarn!! And naturally I had to make a few scarves! the off white set is sooooo fluffy it’s like having a cloud wrapped around you. The dragonfly scarf is also very soft and currently my only (how did that happen?) #wip !! I’m very pleased to say I finally finished my sidewalk shawl. So much so that I’ve actually decided to model it to show here! I’ve also made my first cardigan but the photos are hiding! It took me a while to work up the nerve to make something to wear. Since my weight loss journey was near it’s end I decided I could invest some time into a big project. I’ll just have to take some more photos and make a whole new post! I’ve had some black and red yarn and an idea about creating a Mickey blanket for years now. Perhaps this is the year to finally pick a design? I’ve seen a few C2C patterns that just might work! I wish you kindness and creativity for 2019! Funny the accomplishments that you’re excited about. 🙂 I’ve made infant/toddler hats successfully before but older children/ adults … not so much. TIP: Always mark the first stitch in your round! Overall I find I crochet a little on the loose side, for this hat pattern. She includes a test pattern to check your gauge. Which is handy. For my hubby, he picked Caron Simply Soft in Gray Heather. It makes a nice soft hat. This yarn is on the silky side for hats…. very floppy but he likes it. Even though the yarn isn’t chunky (it’s a medium/4) I found it worked well. I used the same pattern with a smaller hook (yarn recommends 5mm) for a second hat that fits slightly snugger. He finds it warmer. I also used the Men’s Chunky Stripe Beanie pattern for this next hat. This time using Charisma by Loops & Threads in dark purple with black for accent. For this hat, I used the 8mm which is the recommended hook size. I find the hat very loose but my son says it’s ok, fit wise. I’m going to try a hook size down the next time. This yarn is described as bulky (5) so I thought that it would have worked better size wise. The other pattern that I used this month has more detail in its style. My daughter and nephew’s girlfriend will be getting these as gifts. The Alpine Nights Beanie by Pattern Paradise has a slightly more advanced stitch (for beginners) but once you see how to do the fpdc / front post double chain (to make the waffle pattern) it’s another ‘quick to work up’ hat. The original pattern uses Caron Cakes but for this hat, I used the Caron Cupcakes, Strawberry Pie. This yarn is finer than the Caron Cakes. It’s a Light/3 weight yarn. It worked up very well and I had some yarn left over. I added the pompom that comes with this cute yarn but when we tried the hat on the pompom seemed too small. This pattern has a companion pattern, the Alpine Nights Super Scarf. I’m loving the waffle pattern so I’m going to use it to complete the gifts. I’m pondering making it into an infinity scarf. I’ll see what happens when I start it. It’s nice to see results when crocheting. I usually make blankets, some of which I work on for months, so it’s very rewarding to see so many projects done in one month. Next weekend I’ll post about November’s projects in Yarn & Tea. Can’t love what you’re making? Love who you’re making it for. 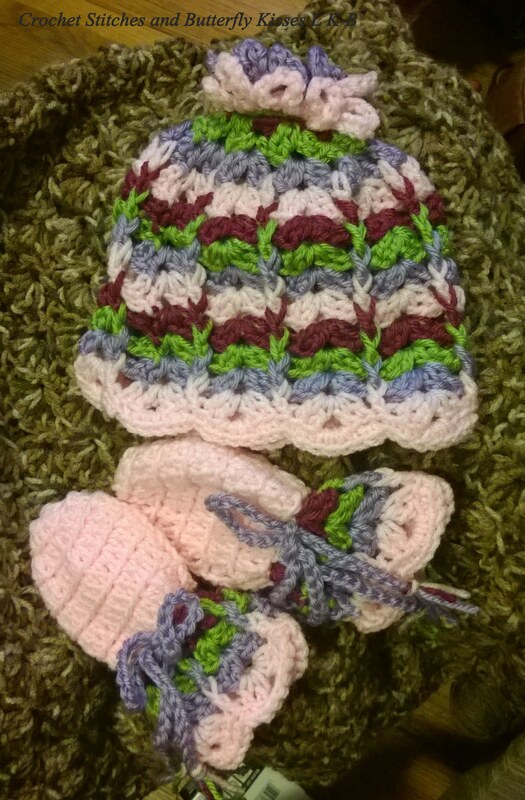 A friend asked me to make a hat set for her daughter and her daughters elves. I told her that I have yet to make a hat ‘successfully’. But she had faith that I could create something that she would like. After many tries with various patterns, I finally ran out of time and had to give her my last attempt. The hardest part is she had a hat in mind that didn’t have a pattern. So I now had to figure out how to make a hat and find a pattern that was close to what she wanted. I don’t think I succeed but she’s kind and said it was lovely. It was so much bigger than I imagined. My daughter says that because I’m not used to slouch hats. This project really hit home for me why I crochet. It’s the creative process that I enjoy. I like the colours and textures. I like figuring out the patterns. It’s the joy of making it. 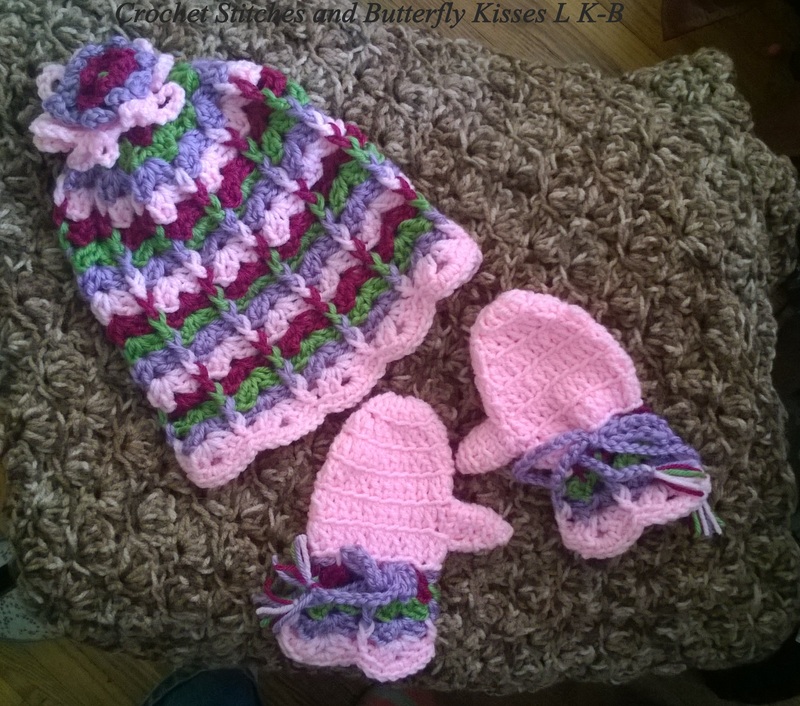 She asked for a slouch hat, a scarf and mittens plus matching hats/scarves for her daughter’s elves. The rest of her order worked up well. I had fun creating tech covers. And I loved the yarn and pattern for the toddler/infant sets. Overall I was excited to create projects for this friend and was honoured that she asked me to make these for her. I hope her daughter enjoys them! The infant/toddler set’s patterns can be found in the post linked above. For the mittens: I shortened the cuff by a few stitches and did 20 rows for the cuff. Which meant 20 stitches for the round that creates the hand part. From their I followed the pattern for child (adjusting for the extra stitches.) I did this because the child’s size is too small and the woman’s is too big for a 10 yrs old girl.